Sweet itch is a condition in horses caused by an allergy to the saliva of biting midges (Culicoides). When a sensitive horse is bitten by a midge, its skin soon becomes irritated and itchy. The horse tries to rub this area, inflicting damage on itself. Contains insect repellant and skin care 100% pure essential oils. Use Eczema sheets designed or modified to extend at least halfway down the horse's tail, thereby covering areas that gnats especially like to attack. combine with the dietary supplement Itch Away Herbs or Herbasan Horse for a metabolic activation. 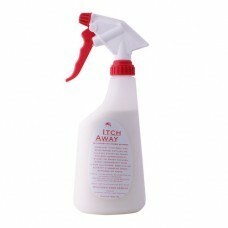 Simply apply the spray to all sore and raw areas. If you are applying to an area with hair, rub it in well and ensure that the product reaches the skin. Repeat the treatment if necessary several times a day.